What future for rugby league in the South after Broncos' relegation? David Lawrenson was on board when rugby league took flight in London. Ten thousand came to Craven Cottage that September afternoon, to see fledgling Fulham beat fabled Wigan on the opening weekend of the 1980-81 season. The crowd that day was a mixture of curious southerners and exiled northerners, such as Lawrenson, elated that the game they cherished had finally taken off in the capital. But the ride has been so tortuous and turbulent that an awful lot have got off. Lawrenson, who remained loyal and is now media man for the London Broncos, has witnessed name changes - from Fulham to the Crusaders to the Broncos to Harlequins and back to the Broncos again - a fistful of owners and countless changes of home. It's a wonder he doesn't have whiplash. Or worse. For this was the season the great London rugby league experiment, as some sceptical northerners still deem it, crash landed. Having narrowly avoided entering administration last December, the Broncos were however relegated from Super League for the first time. One win, 26 defeats, an average attendance of 1,000, people asking: "Is rugby league in the south on life support?" The sport returned to the capital in 1980 when Fulham FC chairman Ernie Clay announced the formation of Fulham Rugby League Club. Games have been staged at various venues around London, with Craven Cottage, Crystal Palace National Sports Centre, The Valley, Griffin Park and Twickenham Stoop among longer-term homes. Semi-professional side London Skolars were formed in 1995 while Hemel Stags joined the third tier Championship One this season. "It's been difficult and dispiriting," says Lawrenson, originally from St Helens, whose adopted side shipped two late tries to lose 46-36 against visitors Bradford in Saturday's final game of the season. "Losing every week, small crowds, other clubs' fans looking down on you. But even if the Broncos ceased to exist, rugby league would continue to thrive in the south. It's embedded, here to stay and there's still so much potential." For rugby league in the south isn't only the Broncos. 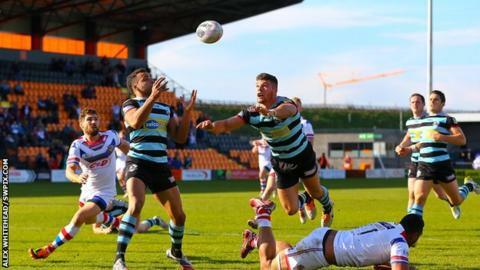 There are five non-northern teams in the third tier of the Rugby Football League, including semi-pro outfits London Skolars and Hemel Stags, who produced Dan Sarginson, now of Wigan, and Kieran Dixon, now of the Broncos and soon of Hull KR. "We've got a great product and vibrant competitions," says Martin Coyd, chairman of the London Youth, Junior and Primary League and director of rugby at Medway Dragons, who are based in Gillingham, Kent. "If the Broncos went under, we'd carry on. We've been going for seven years and have kids who have only ever played rugby league, it's their sport of choice." Dan Steel, until recently the RFL's regional development manager for London and the south, estimates there are 1,500 kids playing rugby league in the region. Their season culminates in the London Origin Series, which involves players chosen from north and south of the Thames, from under-12s to under-17s. Another showcase for up and coming southern talent is the Champion Schools final at Wembley, where the Year Seven competition was won by southern schools in 2012 and 2013. However, while hardy seeds have been sown by zealous missionaries such as Coyd, an ill wind is blowing through at grass-roots level. "A bigger threat to the game in the south than the Broncos being relegated is the reduction in the number of development officers," says the Broncos' former head of youth performance Phil Jones, who joined Warrington last November. "Rugby league had its funding massively reduced by Sport England in 2012, from £27.6m to £17.5m, and London has gone from a team of 15 or 16 officers to three or four. It used to be a vibrant scene all over London and the south, but now they're back to having to rely on volunteers to produce players. "For some areas that's fine, but for other areas, where the concept of rugby league is remote, you need that constant reminding, people going into schools, spreading the gospel of the sport. It means that pathway is under threat." Opinions vary as to whether the Broncos have ever done enough to reach out and tap into the community scene. But two of the most important people, general manager Jason Loubser and head coach Joey Grima, believe more must be done to clear that pathway between the amateur and professional game. "When I first came to London they were in crisis mode and there were no real systems or structures in place," says Australian Grima, who joined the club's backroom staff in February and replaced Tony Rea as head coach in May. "And I found the community clubs were a little bit distant from the Broncos. "Part of my plan, which Jason Loubser and [owner] David Hughes have signed off, is bridging that gap. The potential in London is unbelievable and the community game should be a major production line. There are more rugby league players in the north, but there are more freaky athletes in London." Grima has held community coaching sessions and identified the Broncos' under-16 academy as a key area, effectively a laboratory which might turn those "freaky athletes" into players fit for the first team and the Super League. But what if the Broncos spend two or three years in the Championship or disappear completely? After all, they almost went under last year and are dangerously reliant on Hughes, who has been bankrolling the club for years. Hughes, who made his money from oil and bought the club from Richard Branson's Virgin Group in 2002, has seen little reward for the millions he has put in (despite being in Super League since its inception in 1996, London have never won a league title or Challenge Cup) and it is no secret that he has come close to giving up the ghost. My first game at The Valley was against Paris and 15,000 people came. I was thinking, 'this is fantastic'. Even when we moved to The Stoop we got close to full houses for the World Club Challenge games against Canterbury and Brisbane. Sarginson, who graduated from Hemel to the Broncos (or Harlequins as they were then) before joining Wigan last October, says that if there hadn't been a Super League side in London, he would have chosen rugby union instead. "I was also at the Saracens academy, so was juggling the two sports," says the 21-year-old, who knew next to nothing about rugby league before Hemel's then-community coach Callum Irving dropped in on a school PE lesson. "I preferred rugby league so as soon as I was offered a contract by Harlequins, I snapped their hand off. But if they hadn't been in Super League, I would have taken a different route. I've known plenty of rugby union players who have come over to league. But if they stay down for too long, that won't happen." Another worry is that if the Broncos don't win promotion in the next couple of seasons, those players that Grima hopes to develop into potential first-team players will instead be snapped up by the northern powerhouses. For those who remember the Branson days, which lasted between 1999 and 2002 and when anything seemed possible, the Broncos' current predicament is both depressing and not all that surprising. "My first game at The Valley [Charlton Athletic's ground was home to the Broncos between 1996-1997] was against [now defunct] Paris and 15,000 people came," says Tulsen Tollett, who reached the Challenge Cup final with the Broncos in 1999. "I was thinking, 'this is fantastic'. Even when we moved to The Stoop in Twickenham [home to the Broncos between 1997-1999, their second of three spells at the home of Harlequins rugby union club] we got close to full houses for the World Club Challenge games against Canterbury and Brisbane. "But it was always difficult getting good players to move down from the north and when a young guy who came through the London system did get a start in the team ahead of an overseas player, one of the northern teams signed him." With performances on the pitch ranging from the sometimes good to the typically mediocre to the occasionally appalling, the Broncos, or Harlequins - nobody seemed too sure who they were any more - saw attendances dwindle as the 2000s wore on. "We've seen in the past that there is a big audience in London," says Ian Lenagan, who was the majority shareholder of Harlequins RL between 2005 and 2008 and is now the owner of his hometown club Wigan. "But they won't come to watch if the team is getting battered every week. So what do London need to do? Put together a decent squad that can win." It would also help immeasurably if the Broncos had somewhere they could definitively call home. This season home was Barnet FC's Hive Stadium and a deal has been done for next season, too. But Loubser was unable to give any assurances that the Broncos would be playing there beyond 2015. Almost everyone I spoke to agreed that neither the Broncos or the RFL have done enough to market the game in London. Grima related that when he's out doing his shopping people ask him what the London Broncos are when they see the logo on his shirt. But even if the club doesn't possess the necessary funds to market itself across the south - relegation means a drop in income of £1m - a settled home would at least enable the club to implement a more localised marketing campaign. "They need to sign a long-term deal so they are able to say: 'This is where we want to be and where we want to stay'," says Jones. "It's virtually impossible to plan long term, increase attendances, get into local schools and communities, unless you know you're going to be somewhere for a sustained period." There are those who wonder why the RFL is so adamant that rugby league must have a Super League presence in London. Surely, they say, the Broncos' travails only prove that rugby league is a sport southerners will never fall crash-bang in love with? But you can't on the one hand complain about the sport's low profile and on the other suggest that it should remain a regional game. And if England want to match the Aussies and Kiwis it would be unwise to ignore all those freaky athletes roaming the streets of London and elsewhere beyond the north. "Rugby league is no more a regional game than rugby union," says Lenagan. "There are rugby union clubs in the north but there are rugby league clubs in London, Oxford, Gloucester, Portsmouth, Coventry and Maesteg. "So it is essential that rugby league is represented at the highest level in London and it behoves the RFL and Super League to make sure every opportunity is presented to London to sustain and develop a Super League team." But while RFL chief executive Nigel Wood agrees the governing body must do all it can to ensure the professional game has a presence in London, he also stresses that, in the interests of impartiality, it can only "assist, support and provide counsel and advice". Winning promotion from the Championship will not be an easy task but with a whole new squad already signed for the 2015 season, local talent eager to impress and the club willing to use the full salary cap, they at least look vigorous and focused. Lawrenson will be cheering from the sidelines as always next season, at The Hive but also in heartlands such as Batley, Dewsbury and Keighley. Tough towns, but it's time to toughen up and get some gravel in their guts. It might be just what the Broncos need.